My father started collecting beer steins back in the 1970’s. Not that my family are heavy drinkers but my Dad liked an occasional beer and I do as well. Most steins are German made. At least the collectible ones are. Who hasn’t heard of Mettlach steins? The most collectible stein for stein collectors. Steins or tankards as some collectors call them have a 400 year history. Like many collectibles that 400 years can be broken down into periods when certain makes and makers were prevelant or popular. Earliest Steins 1525 – 1700 A.D. Transition Period 1700 – 1850 A.D. Most steins are pottery or stoneware. Many are handpainted or early faience peices are modeled after chinese procelain. Faience being one area of specialized collecting in steins. Other things to look for when collecting steins. The shape of the stein, the size, the lid (pewter or tin), whether the lid is inlaid with porcelain or has a high finial. Decorative thumblifts, lidring, footring, the handle if decorated can help distinguish the maker of a stein, but of course the most important are maker’s marks either stamped, imprinted or painted on the bottom of the stein. 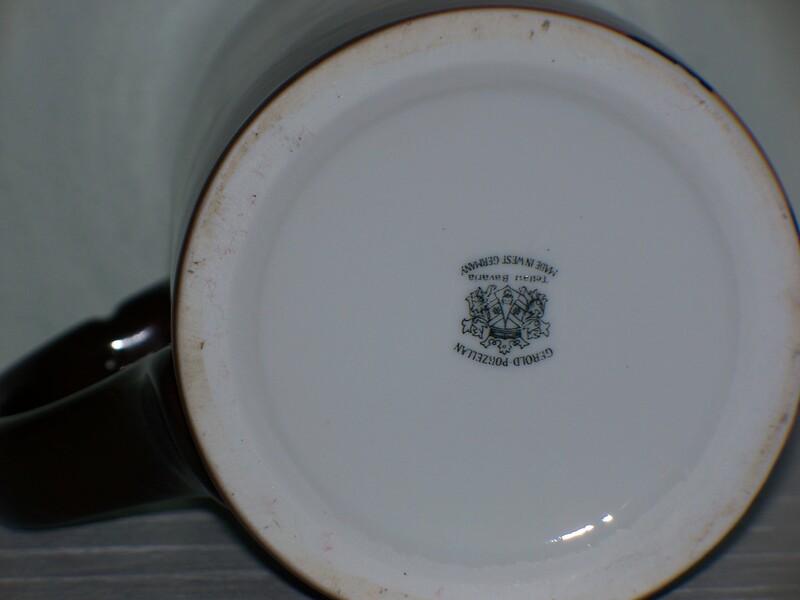 Maker’s marks on steins, it seems like there are 1000s. Researching marks can be a time consuming task but as collector’s, research is at least half the fun. 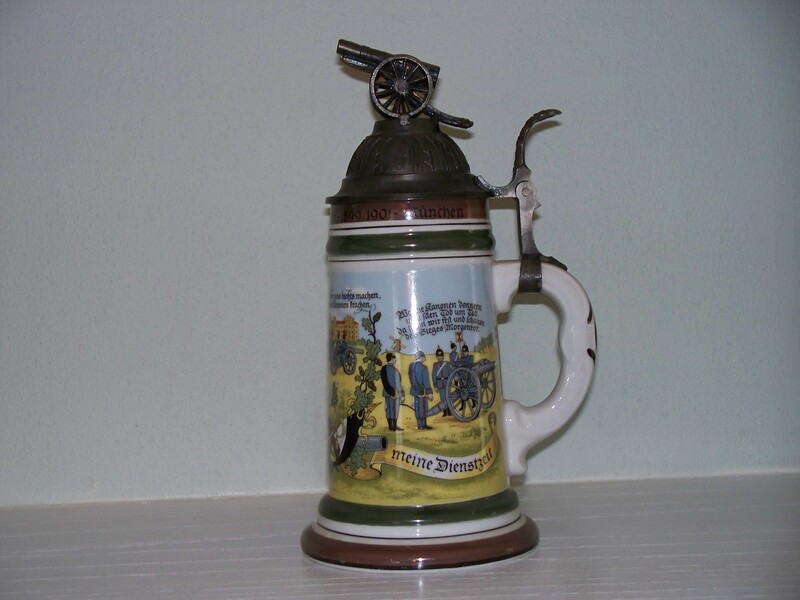 Buying an old looking stein at a garage sale or thrift shop to learn you have a collectible that is desired by stein collector’s is great fun, exciting and sometimes profitable. This is a reproduction but resembles a Faience stein. A significant area of stein collection are the old Regimental steins. I see many up for sale on eBay and in trade/collector catalogs. Men who served in a unit in Europe throughout history were given a stein that recognized their service to their country and identified their unit. These steins also have been copied. In fact now even some of the copies are almost antique. 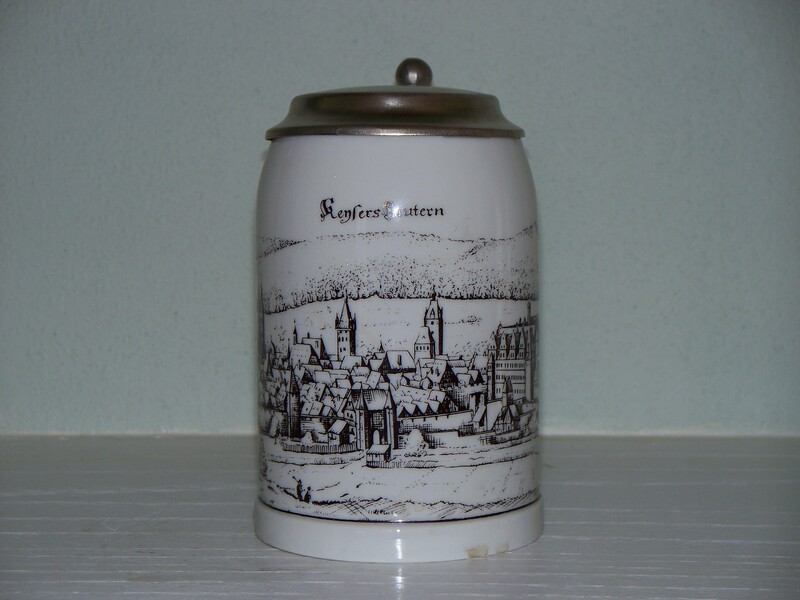 The above pictured stein is actually a reproduction of an original Regimental Stein however this stein was made sometime around 1947 by the Porzellan und Glasmalerei Karl Rau. The lid is pewter and hand welded. Note the lithopane bottom of a dancing couple. 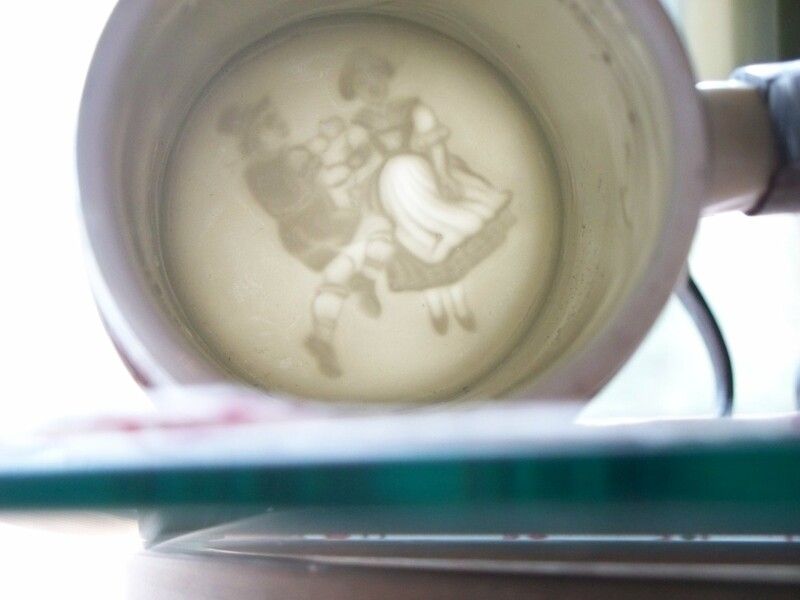 Lithopanes are often found in the Regimental Steins. Just a short blurb on Maker’s Marks. Many steins have Germany stamped or imprinted on the bottom with numbers. The numbers most often identify what mold was used. The trick is to be able to identify what factory or maker the stein came from. So the numbers don’t mean much except to give the feel that the stein did have a mold and to tell us the stein was not hand thrown (method of making steins from the very early period). I have two dozen German Steins that are currently being marketed. Visit my store by clicking on My Assistant (the Duck) and read the descriptions of some of the steins in my collection. 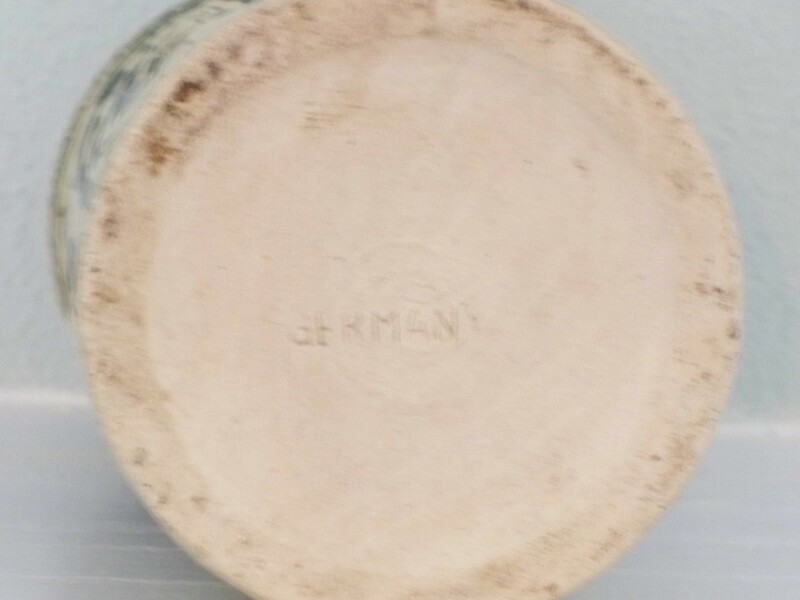 In my next post I will talk about Occupational Steins during the war years WWII. Until then, happy collecting and remember “the best is yet to come”.